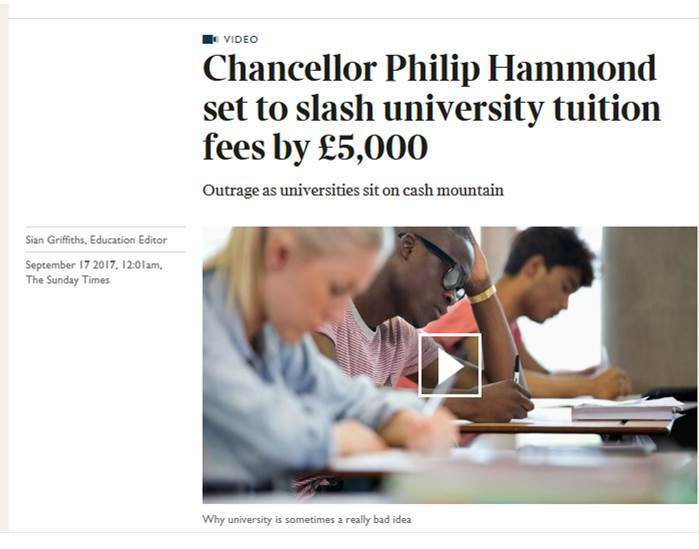 The proposal to cut undergraduate fees in United Kingdom universities to £7500 is at present no more than an article in The Sunday Times, and even here the details are hazy. But it feels like the obvious – not to say ‘logical’ – conclusion to this summer’s frenetic discourse on higher education. It is the product of a government with neither money nor authority, distracted by bigger things, scrabbling about for scraps of political capital. To say that this government has lost its sense of direction on higher education would be a desperate understatement. The Office for Students is not yet in operation, but already it is beset by enquiries that go to the heart of its purpose. The Teaching Excellence Framework assumes a new form every time Jo Johnson opens his mouth. We surely have cause to fear that research policy will be the next thing sucked into this vortex of Tory chaos. They don’t even know what questions they’re trying to answer. Do they want to address stubborn problems of social representation in higher education? Do they want to manipulate the graduate skills base? Do they want to redress the balance of financial commitment, between the state and the student? Or do they want to chase younger voters? The madness is accentuated by the way that the Conservatives just last week ignored Labour’s effort to cap fees at £9000, blocking the £250 rise that universities and students have been expecting for many months. So they ignore that initiative – thumbing their noses at parliament – yet now (apparently) propose something much more damaging. There’s all sorts of sense in that. It appears the cut in fees will be justified by the assertion that universities have large cash reserves. To be fair, there are a handful, for various historical reasons, that do. But universities have been running surpluses – in most cases – because they are required to to do, and there are many more debt-valleys than cash-mountains across the sector. Plenty of universities have borrowed considerably in order to make themselves more competitive: or, in other words, more attractive to students. These loans (at historically low interest rates) have made sense, but only to the extent that fee-income can be assumed. How many of those lenders ever considered the possibility that a government might be sufficiently unhinged to undermine the income sustaining British universities? How many people – anywhere – ever considered that a British government would actively undermine one of the country’s greatest assets, its world-class higher education sector? This damage will flow from a debate that has focused too much on those who pay, and too little on those who receive and spend that income. There’s a level of magical thinking in the idea that students will benefit from weakened universities – forced to cut staff and facilities, bound to slide in terms of international reputation – simply because they leave with a slightly lower level of debt. That’s consistent, perhaps, with the level of debate on Brexit: the obsession with not paying any more to the EU, without taking any interest in what the money actually achieves. We are not blessed at present with effective or rational public discourse – on anything much at all. But I think the sector also has itself to blame. The existing system of fees has had precious few supporters, while very many people have been prepared to trash it without having the slightest idea of a sustainable, realistic alternative. Too many people – including our academic union – have got sucked into the criticism of vice-chancellors’ salaries, failing to appreciate that the most likely outcome, every step of the way, was a cut to the whole sector. We will see vice-chancellors taking pay cuts, to be sure; and many high-performing academics will simply clear off to countries that treat universities with respect. But in the meantime, how many thousands of lecturers will lose their jobs if this proposal becomes reality? As we should have recognized, what’s left when a government loses touch with rational policy-making is the muscle-twitch of ideological reflex. So they want to hit the post-92 universities, because they’ve never liked them much. I mean, who’s going to miss a few of them? So they want to hurt the arts humanities, because we’re all soft lefties and it irritates them that so many students want to study our subjects. And they’re happy enough to inflict austerity and confusion on the one sector that had largely evaded both these prevailing national conditions. The fact that British universities generate income and knowledge seems barely relevant. This is a government that has has abandoned its grip on any form of economic reality. They’re so clueless they thought CEOs of FTSE500 companies would support their delusional Brexit strategy. The fact that our universities are respected across the world is equally irrelevant, since Britain’s position in the world is sliding so fast that the people running the country have presumably ceased to care. In a context of illogic, cutting fees becomes entirely logical. The universities which have money also chose not to pursue ambitious expansion agendas. Perhaps that is why they are richer in the first place as theyve been in higher education long enough to know it goes through booms and bust and plan accordingly.